Whomp whomp. 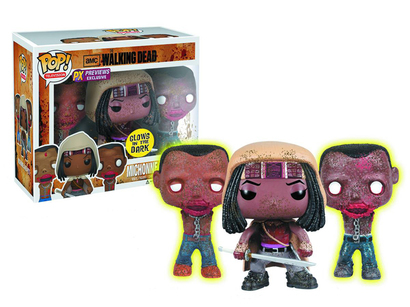 There're no Michonne & Her Pet Zombies 3 Pack (Glow-In-The-Dark Variation)s for sale. Michonne (pronounced mih-SHOWN) is a main character and survivor of the outbreak in AMC's The Walking Dead. After the Greene family farm was overrun by zombies, Michonne encountered Andrea and the two became close friends throughout the winter until they entered Woodbury. Later Michonne left Woodbury and became a key member of Rick Grimes' group. Her favored weapon is the katana. In the early stages of the zombie apocalypse, Michonne’s boyfriend Mike was bitten, but she did not realize he was infected. After returning from a supply run, she returns home to find that both Mike and his friend Terry have turned into walkers. She’s able to lock the two away, but her house becomes surrounded by walkers and she’s trapped. Because she notices that walkers don’t attack each other, she hacks off Mike and Terry’s arms and lower jaws and chains them up in order to escape her home. *** Only the 2 Pets glow after about a minute of exposure to light. The Michonne figure DOES NOT glow.